Utilis and their leak survey method was welcomed by the Ministry of Public Utilities in Trinidad and Tobago in January. The island nations are moving into their dry season and the Ministry has contracted with Utilis to provide its patented technology to identify sub-surface leaks in the municipal water distribution system. This project is being supported by the Inter-American Development Bank (IDB). Utilis and IDB are assisting the Ministry to reduce the high levels of water loss currently being experienced. While in the country, the leak detection team will carry out several site verification efforts in collaboration with the Water and Sewage Authority (WASA). 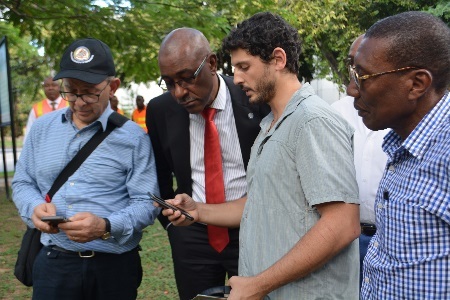 Vitaly Bernshtein, a Utilis Analyst, met with Senator Robert Le Hunte, the Minister of Public Utilities, and explained the technology and process for leak verification.